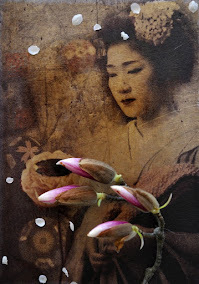 In my work I combine portraits of women Geiko, Maiko and my two daughters with cascades of flowers and petals. My subjects interact with nature to render an ephemeral, fleeting and melancholic feeling to the viewer. They flow harmoniously, in an evanescent atmosphere. I have been listening to my perception of beauty or melancholy which springs from the natural passing of Seasons. My art is an emotional research into the symbolism of “Mono no Aware”. The themes of life & death, of presence & absence, of human emotions, of spirituality, of memories are key topics which are dear to me. I have always been intrigued by the power and mystery of the moon and by the sun as a light source, fascinated by their continuous change of reflections. 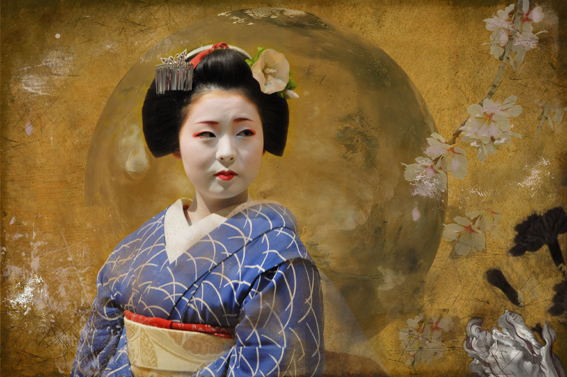 In “月のもう一つの顔 Another Side of the Moon” I focus on the moon as a metaphor and a great source of inspiration.